The US stock market had just experienced four consecutive years of negative returns. A 1929 dollar invested in stocks was worth only 31 cents by the end of 1932. Hopes were sinking during the Great Depression, and many people felt as though the economy had permanently changed. Many investors left the market, and some would not return for a generation. Amidst what is considered the roughest economic time in US history, the markets looked ahead to recovery. World War II was raging, and the US had just entered the conflict. The US stock market had experienced two consecutive years of negative performance, and the economy had shown signs of sliding back into depression. Although conversion to a wartime economy would revive industrial production and boost employment, investors struggled to see beyond the conflict. Many expected rationing, price controls, directed production, and other government measures to limit private sector performance. Investors had just experienced the worst two-year market decline since the early 1930s, and the economy was entering its second year of recession. The Middle East war had triggered the Arab oil embargo in late 1973, which drove crude oil prices to record levels and resulted in price controls and gas lines. Consumers feared that other shortages would develop. President Nixon had resigned from office in August over the Watergate scandal. Annual inflation in 1974 averaged 11%, and with mortgage rates at 10%, the housing market was experiencing its worst slump in decades. With prices and unemployment rising, consumer confidence was weak and many economists were predicting another depression. 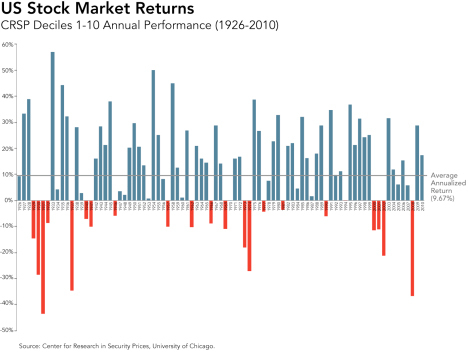 The stock market had delivered strong positive returns in five of the last seven calendar years, and the two negative years (1977 and 1981) were only moderately negative. Despite these results, investors were weary from stagflation, which was characterized by high annual inflation, anemic GDP growth, and unemployment, and from fears of another economic downturn. In late 1980, gold climbed to a record $873 per ounce-or $2,457 in 2010 dollars. (By comparison, spot gold reached $1,256 per ounce in 2010.) Memories of the 1973-74 bear market lingered. A 1979BusinessWeekcover story titled “The Death of Equities” claimed inflation was destroying the stock market and that stocks were no longer a good long-term investment. On “Black Monday” (October 19, 1987), the Dow Jones Industrial Average plummeted 508 points, losing over 22% of its value during the worst single day in market history. The plunge marked the end of a five-year bull market. But in the wake of the crash, the market began a relatively steady climb and recovered within two years. The effects of the crash were mostly limited to the financial sector, but the event shook investor confidence and raised concerns that destabilized markets would increase the odds of recession. The market slide that began in 2008 reversed in February 2009-gaining 83.3% from March 2009 through 2010. Despite two years of strong stock market returns, memories of the 2008 bear market and talk of the “lost decade” have led many investors to question stocks as a long-term investment. But earlier generations of investors faced similar worries-and today’s headlines echo the past with stories about government spending, surging inflation, deflationary threats, rising oil prices, economic stagnation, high unemployment, and market volatility. 1. Adam Shell, “‘New Normal’ Argues for Investor Caution,” USA Today, August, 16, 2010. The term “new normal” originally referred to a post-global financial crisis environment characterized by several years of sluggish economic growth, below-average equity returns in developed markets, high market volatility and risk, high unemployment, and a world in which the range of possible financial outcomes is wider than normal and wealth dynamics are moving from developed to emerging economies.